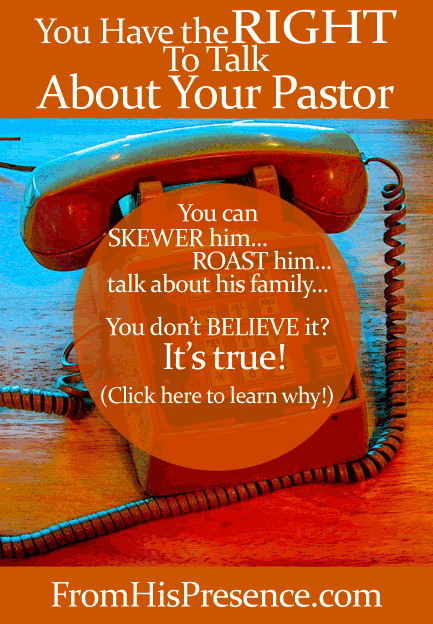 Did you know that you have the right to talk about your pastor? You have the right to meet with the hallway committee right after church and tell everybody what you think. You have the right to talk about how much you loved or hated the sermon. You have the right to tell people how you can’t believe what the pastor (or the pastor’s spouse) was wearing. You have the right to complain about how he or she runs the church. You have the right to talk about his or her family, personal life (fact or fiction), choice in cars, and more. You can roast the pastor in front of him, behind his back, on Facebook, or any other way. You know why you have that right? That’s why you have the right to talk about your pastor. Anytime you want, any way you want. But you know what? Having the right does not make it right. Just because the law allows you to talk about your pastor doesn’t mean you can say whatever you want and still stand before God. I’m sure you’ve figured out that I’m not talking about speaking well of your pastor. No, I’m talking about all the junk Christians just love to say. The gossip. The slander. The lies. The betrayal. The stuff that satisfies your flesh for one moment but soils your soul and your spirit. Why would you even want to get involved in that? Think about it: Even if you disagree with the pastor, you are the one choosing to attend your church. If it’s that bad, leave the church. If it’s not bad enough for you to leave the church, then SHUT UP! …wouldn’t it be better to stand righteous before God? Wouldn’t it be better to have clean hands and a pure heart? Wouldn’t it be better to honor the pastors who have poured out their lives to feed YOU? Wouldn’t it be better to obey God’s Word? Let the elders who rule well be counted worthy of double honor, especially those who labor in the word and doctrine” (1 Timothy 5:17). “Therefore I exhort first of all that supplications, prayers, intercessions, and giving of thanks be made for all men, for kings and all who are in authority, that we may lead a quiet and peaceable life in all godliness and reverence” (1 Timothy 2:1-2). “Remember those who rule over you, who have spoken the word of God to you, whose faith follow, considering the outcome of their conduct” (Hebrews 13:7). “Be kindly affectionate to one another with brotherly love, in honor giving preference to one another” (Romans 12:10). Those verses are just a tiny smattering of the verses in the Bible that command us to love and honor our pastors and leaders. We teach these verses. We read them. We study them. We preach on them. How about, instead of gossiping about the pastor, from now on we start praying for the pastor? What would happen if, instead of complaining about the pastor’s nice car, we started thanking the Lord for providing for our shepherd who feeds and nourishes us? What would happen if we refused to allow our ears to become other people’s trash cans, and refused to listen to people slandering the pastor? What if we chose to believe the best of every person (according to 1 Corinthians 13), including the pastor? Could we do it? Would it revolutionize the church? What would happen if we gave up our right to free speech–gave up our right to talk about the pastor–and embraced being right with God instead? Are we willing to try it, so we can find out? Image courtesy of Oskay on Flickr; Windell H. Oskay, www.evilmadscientist.com. This post is linked up at JuanaMikels.com. powerful words, Jamie, and ones that your pastor will appreciate if he knew you wrote this! I am constantly reminded of what our pastor deals with: broken marriages, affairs, adoption falling through, families loosing their home. All very pain situations and very often my pastor is called in to help and come along side. Our pastors NEED our prayers. So true, Hope. We need our pastors and they need us. No man’s shoulders are wide enough to carry such a burden alone. When pastors and other leaders learn to fully submit to a full council of elders then this article makes sense. However, when pastors lead as dictators and assume full responsibility for the actions of the flock then he is no longer serving as an under-shepherd and has elevated himself to the roll of shepherd, which is Jesus’ position, not his. The church should be run by Jesus through Godly, Biblically qualified elders. No one deserves to be talked about behind their back, but the leaders have to be man enough to listen to it (humbly) when it comes up. The American Church has to get over this cultish idea of man worship and return to accountability, mutual submission, and glorification of the Father through His son Jesus, empowered by the Holy Spirit. End of Story. I agree Mike. For some pastors it is really hard to listen to credit. So God has set a ‘system’ in place (elders). I do pray we have enough courage to always confront when we see wrong or have questions, even with pastors.